Today's project was so easy. 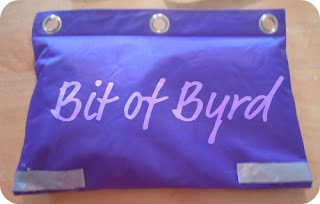 If you follow my blog and my projects, easy is a theme. I love easy projects! I loved I Spy books as a kid. Even as an adult, my sister and I have played I Spy games via Facebook or other websites. I knew I had to make one... or five! Step 1:: Pick your trinkets. Lay them out. Take a Picture. I took my picture on a white piece of paper for ease of editing later. I have 38 trinkets. I don't have kids, so most of mine were bought. 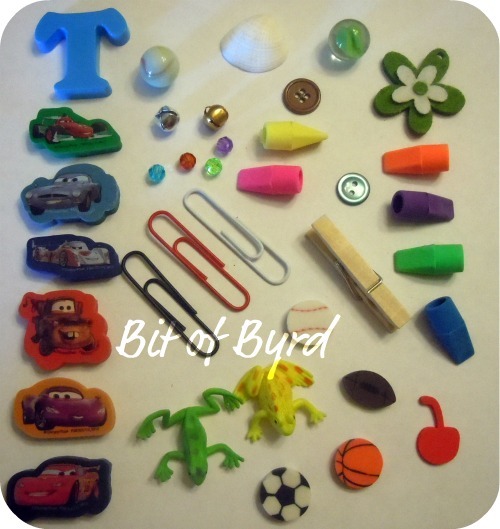 The erasers (cars, sports, pencil), marbles, frogs, the letters were all bought. The rest I had. Each bag was different so I took pictures for each bag. Having the letter in them helped keep them straight. 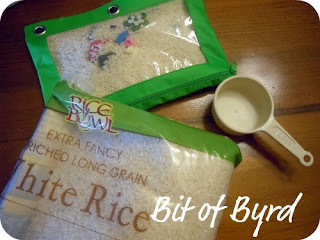 Step 2:: Measure your rice. Wash your rice. Let it dry. Wash the rice? Yes. That is what the alcohol is for. How much do you use? I'm not sure. I didn't do this step and my bags ended up being dusty inside and all the trinkets were covered in a haze. I used 2.5 cups for each bag. I would put my rice in a plastic seal bag or bowl, add 1/8 cup rubbing alcohol and shake it up. Lay the rice out to dry on a cookie sheet. How long does that take? idk, I didn't do that part. remember. Put it in the sun and I think it will go fast. 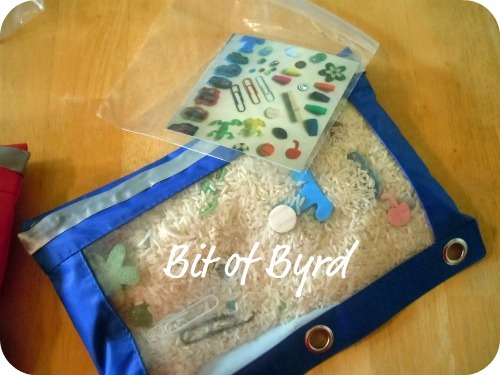 Step 3:: Put your trinkets and your rice in the bag. Did you really need a picture? Sorry. 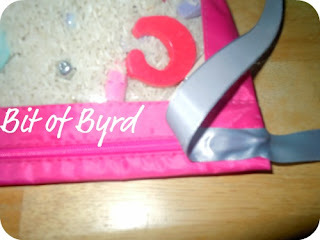 Step 4:: Hot glue ribbon over the zipper. We don't want this bag coming open! I first glued down the zipper pull. Then I glued the ribbon down. It overlaps and it glued on the back also. Step 5:: Print your key. You can see my key for Tristen's bag here. I plan on reprinting them and laminating them. But the project came together very fast so we used Brittany's cool printer thing and we printed these pictures and put them in bags to keep them safe for now. Are you curious if the kids liked them? These are my crafters. Well, not mine. Brittany's from The Butterfly Mom. I also made one for my bff Sabrina's son Carter and my niece Evie. Tristen and Evie are under 3 so I didn't ask for their review but the other kids were all asked the same questions. -My favorite part is... "there is a whole bunch of things and a lot of them are hard to find"
-The hardest thing to find... "the football"
-It would be better if...."if the football wasn't in it and if you washed the rice"
-A tip to other kids would be..."if they asked me where the football is, I would tell them it is covered in dust. For everything else, when you're trying to find things keep flipping. Go from the sides and you will get the jackpot"
-My favorite part is... "shaking it to find things 'cause it's fun." -The hardest thing to find... "the little crystal balls"
-It would be better if.... "if it had less rice so my arms don't get so tired." -A tip to other kids would be... "it's not so hard, just have fun with it." -My favorite part is... "when I find the stuff really fast." -The hardest thing to find... "the shell." -It would be better if.... "if someone helps me." -A tip to other kids would be... "look on the card for what you need to find." Tristen plays with it and finds stuff but had no comment. My god-son is 9 months old and he likes the sound it makes when he shakes it. So there you have it. An easy No-Sew I Spy bag that you can make in no time for little to no cost. 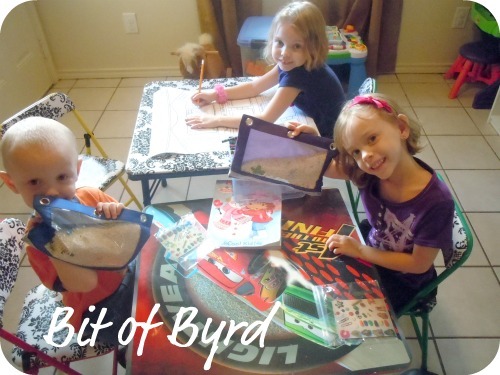 Makes great gifts, and on the go activities.